Enough rambling though, here’s a run down recap of events. We were hunting out of a raised blind at a water hole/feed spot about 7 foot or so off the ground. Spot and stalk was pretty much out of the picture due to super dry conditions and little to no cover other than dead, crunchy, knee high grass. Mornings were spent hanging out at camp relaxing, shooting bows, telling lies, and catching up since our last gathering. The buffalo herd we were hunting basically laid up all day moving very little, then would work their way into the area where the blind was anywhere between noon and 3 or so, then slowly come in to eat bananas. The first day when we drove through and spotted them, I thought this isn’t going to be a big deal at all as they held back in the brush a hundred yards or so watching as we passed on. That was my first wrong thought as it was just beginning of a 4 day ride they were fixing to drag us through. For the first two days, they toyed with my heart and sole. They would come in, leave, come back and so on. One old cow in the herd basically ran the show and knew something was off and really hosed is on multiple occasions. The second day though was the worst. Between the old cow's bad attitude and so, so many close calls at getting a shot at our target bull, my mind and heart took about all it could handle. Over 6 hours of back and forth trying to get the bull in range an also getting a good shot angle just never came to fruition. At one point, he stood in the same spot for over 30 minutes facing us the entire time only to turn away without presenting a shot. On the third day, they broke all our hearts when the wind blew their way and they stampeded away (truly a stampede). The 4th day (last scheduled day) of the buffalo hunt it all came together. We had one bull in the herd that was our main target, and another that was an old hard boss bull that was also a possibility if everything worked out that way. Last evening of the hunt, both bulls came into range right off the bat, but like all other nights they did so facing us. I stood on one side of the blind and my PH Lammie stood on the other. I was keeping my eye on one bull and he was watching the other and our plan was to wait for the first one to screw up and turn broadside and that would decide which bull we would shoot at. About 10 minutes in, the bull on his side turned broadside and time felt like it stood still. Lammie gave me the thumbs up and from there I went into autopilot. All the shots I’d taken, and all the time I’d spent looking over Buffalo pictures studying anatomy came down to this one moment I’d hoped, dreamed and prayed for. I did like I had forced myself to start doing when I began shooting my heavy bow and checked to make sure I was at full draw, then pulled down onto the Buffalo and focused on my spot right above the top of the crease behind the shoulder. 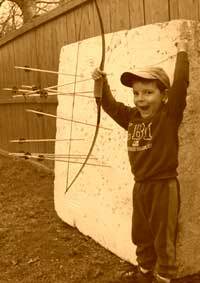 I remember thinking “Lord let this arrow be true” and without another thought the arrow was in the air heading on its way 18 yards to its final destination right spot on to where I was looking. When the arrow hit the buff, it literally sounded like a 2 x 4 getting cracked in half over a brick wall, and instantly I knew I’d hit my mark. The buff whirled around and the herd stampeded away. I knew my shot was good, but was a bit worried about my penetration. We reviewed the video footage and decided I’d gotten enough to get into the top of the first lung for sure. We called in the troops and hung out for about an hour talking, shaking hands and waiting it out. I always thought waiting on going after a Whitetail seems like an eternity, but waiting to look after shooting a buffalo was absolutely longest feeling on waiting on time to pass that I can remember. We finally drove around to the area wed last seen the herd, and low an behold there stood my buffalo by himself. Visibly, we could tell he was hurt by his body language, but how bad he was hurt was uncertain. We slowly drove on and parked a ways out and waited a bit longer for the buffalo to expire. About 30 minutes later, we drove back into where the bull was last standing, but he’d moved on. We drove up a dry wash about 50 yards or so from where we had last seen him and spotted him laying down but still alive. We sat back and watched for a bit and knew that he was in bad shape, but with light fading fast, we had to make a decision on what to do. We decided it was best to try and finish him off versus leaving him overnight and risk the herd coming back to him. If that were to happen, we were afraid he would get up and move on until he couldn't go any longer and we may never be able to find him. So, we geared up and headed in. This is where I all of the stories of dead buffalo coming to life started playing in my head, but thankfully, my mind stayed clear enough to not dwell on that and to stalk into range. We were fortunate to able to get into position about 20 yards away and get another arrow into him and seal the deal. My buffalo was down for good. What weight bow, arrows and broadhead? Sounds like a great hunt Shiloh. I’m glad you got to realize your dream. Nice buff. Amazing. Very interested in the details of your setup. I hunted South Africa about 20 years ago and had a herd of buffalo come into the water hole I was sitting. I'm not sure I could compose myself enough to make the shot. They are a ver very intimidating animal. Congrats. That's a major accomplishment!! Great Job! That thing is a beast! Congratulations. It is a real pleasure to see someone who is truly humbled at such a blessing and such an accomplishment,,,Not like some of these ciecus clowns that use terms like "smoked him". "dirtnap" or "smack down" etc showing no respect for the game animal or the sport. You are truly a class act. Congratulations again !!! "Whitie"
Nice! It must be like trying to kill a pickup truck! Congratulations!!! Glad to hear it all came together for you Shiloh. Sounds like the hunt of a lifetime, with memories that will last you a lifetime. Congratulations! congrats. great story too. A little more detail on the equipment would be nice though. Excellent!! That is so awesome!!! Great write up and thanks for sharing! Great story and an Old Dugga Boy! Thats some nerves of steel crawling up to get that second arrow to put him out of his misery...his old nasty bachelor buddy could have doubled back and been laying in wait for you. Any good hunter would have to have great big ones to hunt a Cape Buffalo on the ground? Congrats on the experience you made. You carry a special archery torch. Congratulations. Congratulations! Looks like a beautiful bull, with a good story to go with it. Awesome ! What was the bow and setup you used ? Outstanding! Congrats. Now, we not only need details of your equipment but we certainly need more pics of your trophy and a link to the vid would be even better. I can't think of anything more exciting than take a buff with a longbow. From a dream to reality, hard work and persistence. You made your dream come true. Congratulations. Thanks for sharing your hunt. Looks like a old Buff. Sorry for leaving out bow and setup info. Computer locked up on me before it went through with other pictures. I was shooting a Dryad Orion 3 piece longbow 76lbs @ 28” with Easton Full Metal Jacket Dangerous Game 250s with a 75gr brass insert and 300gr Tuffhead Broadhead for a total weight of 910gr shooting 168fps. Honestly, getting arrows tuned and flying as straight as possible was just as big of an adventure for me as anything. Having never shot heavy bows before, I had to rely on help from several good friends who did to help lead me in the right direction to get my setup running smooth. Your lead photo tells the tale, the smiling comes later. Good story well told. Were you able to determine where your first shot hit and how much damage you did? I don’t usually take much interest in tales of guys sitting in a “blind” (usually the size of a small hut) at a water hole, but I think a tree-stand like you used would be about as much excitement as a bowhunter could ask for without entertaining a clinically-diagnosable death wish! Congrats again Shiloh. I'm certain that trip will stay with you the rest of your life. Heck of a thing Cape Buffalo with conventional equipment. Congrats. Did your arrow hit the shoulder or a rib going in? How much penetration with each arrow? Two blade? The broadheads performance was as good as I could expect. The green head was the first shot and had a steel adapter ferrule. The silver head was the second arrow in him and has a titanium ferrule. The first shot busted dead center of rib and got about 12” of penetration and went into the upper lung with ease. Second hit the edge of a rib busting thru it and got about 16” or so penetration while the bull was bedded. The blade portion of both heads were 100% with no nicks or bends of any sort I could see and BOTH shaved hair off my forearm just like they did before they entered. The green head didn’t completely survive though as the steel ferrule broke off right at the top of the threads at some point while the buff was on the run and hit the brush. I didn’t spin the arrow since the very tip end was busted (last 1/4” or so), but visibly seems to be straight and was very pleased with that. Here’s the damage done. First shot entered rib square on in the center (just my luck) and passed through the other side of the rib off center. My best guess would be the arrow taking the path of least resistance which led it to the side instead of straight through the center like it entered. One thing that surprised me with the ribs on the interior was they were not flat, but pyramid shaped from the top to about 3/4 the way down and they were most definitely all there. Had I been unfortunate to make a bad shot and hit the shoulder blade, I’m nearly 100% certain the arrow wouldn’t have been able to go far enough in to hit the vital organs and cause enough damage to have a fatal shot. The second picture was just an interior shot of the rib cage and how close they run together. Literally a walking, armored tank of an animal! Was there any evidence of rotation with the single bevel? It appears that the ferrule is the weak link in the system. Do you think a glue on with a very dense hardwood shaft would be the way to go next time? Awesome shot and a great bull. Congratulations!!! Thanks for sharing the story. What an incredible achievement. What length Orion riser and limbs were you shooting? Well done! Thanks for sharing the story and pictures. Congratulations! Heck of an accomplishment and adventure. Thanks for sharing! Great pics too. WOW and WOW!!! Congrats Shiloh. Wonderful dream finally realized for you!! CONGRATULATIONS on your accomplishment in taking that old bull with those HUGE BOSSES. Could you tell if he was an old bull that had been pushed out of the herd by the younger studs and could no longer pass on his genetics? I’ve alwsts dreamed of a Cape Buffalo hunt, but I could never build up to the weight you shot him with on your bow. I’m 53 and after a spring of medical issues, I am struggling to get back to shooting my 45 pound bows. If I was to ever hunt one of those rascals I’d have to do it with a classic Double Rifle. Anyway, a beautiful trophy for sure. No doubt it will give you many years of memories and stories to tell about it all. I’d like to be on your next hunt sitting by the fire with you and your hunting buds just so I could hear the whole story told in all the glorious detail. Maybe after a couple celebratory cool ones shared around the fire. Just makes the story details get more vivid!!! ?? One more thing.....I’ve always been curious as to what those big boys actually taste like. How would you describe the meat? Anything it compares to that you can think of?? Osage, I was unable to see any rotation from the single bevel, but the ribs were so massive, it was hard to tell much other than it busted in and out the other side. The steel adapter was definitely the weakest link in the arrow, and I wish I’d have had the titanium adapter up to bat first, but really didn’t pay much attention as to which arrow I’d loaded as I was confident in both setups. I had already bareshaft tuned my arrows before thinking of adding a footer to the last inch or so of the arrow, and when I did, broadhead flight went out the window so I got rid of the footer. If I had to build the arrows all over again, my bareshaft would have started with a footer on the end no questions and really feel like the adapter would have held up. I actually shot one of my heads into a concrete block from 10 yards to see if it would hold up and it passes the test wonderfully. There was a very slight bend at the very tip of the point, but honestly can’t say if it was from the impact of the shot or from me having to chisel the head out of the concrete. The point and arrow still spun with very little wobble after the shot so I was happy. The head penetrated a bit more than 5/8” into the concrete. I know buffalo have been shot in the past with wood arrows, but given the many options available now, I wouldn’t try it. Hearing the impact of the arrow hitting center of the rib, I honestly don’t know if a wood arrow would have held up. Great story of a dream come true,congratulations. That's gotta be something mighty special . Tomas, my riser is 15" and the overall length of the bow is 60" so I believe that would make the limbs fall into dryad's "long" category. Nalajr, the bull I ended up shooting was one of 3 fully mature, hard bossed bulls in the herd. He was not at the tip top of the pecking order, but definitely wasn't at the bottom either. Another one of the mature bulls we were after was heading way down the ranks and got pushed around a lot by the others which made getting a shot at him more difficult because he was a bit timid. Getting up to the heavy poundage was a bit of a task. I shoot 47lbs on my target bows and 54lbs on my hunting rig, so jumping 20+ pounds took some time. When I spoke with Mike Westvang at Dryad 2 years ago about the prospect of building my buffalo bow, I also had him build a "lighter" set of 67lb limbs as well so I would be able to build up to the heavier 76lb weight. About 10 months out from the hunt, I slowly transitioned to the 67lb bow from my others shooting a few arrows a night and slowly adding more and more with every shooting session. I also started hitting the gym (faithfully) 4 plus times a week during my lunch break and had a trainer set up a workout plan to help build my back and shoulder muscles up without me over doing it. My overall goal was to be able to shoot the heavy setup comfortably for several shots without feeling the fatigue of it. I didn't want to just shoot the heavy bow and risk pulling or tearing something, so I transitioned into it as slowly as a could and it worked out well. Now, the 67lb bow seems light to me! The buffalo was exceptional table fair. A group of friends I've shot with for many years from back home actually met up with me over there and began there plains game hunt about half way through my hunt and we had the tenderloins for dinner the first night they arrived. The whole filets were grilled to a medium, medium-rare wellness and I could have eaten just that as for as long as it kept coming. Very similar to beef, but not as much fat and no gamey taste whatsoever. Awesome job. I'm a little jealous, I did a Cape Buffalo hunt last year with my recurve, very similar situation. However, upon impacting the rib, the broadband broke (Abowyer brown bear) and stopped all penetration. I was never able to get close enough for a second shot and on the last night of the hunt, had to finish with a rifle. Thats awesome! Massive looking horns. My compliments. I would really be interested in the details of the Abowyer failure. Those seem to be very well constructed. I have recently purchased some RMS one piece single bevels, and honestly cannot see how these could fail. They are a bit spendy but so are $800 elk tags and plane tickets to Africa. We stand in awe of you sir! Congratulations. Larry, I can't imagine what must have went through your head when you saw your arrow and the point busted. I had tons of people ask the "what if" question about what would happen if I made a bad shot, and to be 100% honest, I was 110% confident in myself and had zero worries about being able to put the arrow where it needed to go. My biggest fear, without question, was equipment failure of some sort. I know every single head out there is going to have a bit of variance in it compared to the next, but the concrete block test helped in easing my mind a bit on my broadhead selection. Any idea as to what caused it to break? Bighorn, yes I was in RSA in the far NE corner about 30 minutes from the Mozambique border and right across the highway from Kruger park. Congrats on your dream hunt. Awesome bull! Well done and well reported. MedicineMan, The "what If" is just part of hunting especially when hunting Dangerous game. I too was %100 confident in my ability to make the shot. I was shooting a lighted nock and when the arrow hit, the light went out and we thought it was a pass thru. but, the slow motion video told the real story. I was sick, it made want to quit bowhunting. Thats when I know how much I'm blessed to have the group of friends I hunt with. They got my mind back in the right place and we spent the next 5 days trying to get close enough for another arrow. I had to finish the last night with a rifle. Looking back, even though things didn't go as planned, I wouldn't change anything. I did shoot the Buffalo 4 times (after he was dead) and had 2 pass thru's and 2 stuck in the off side rib. Awesome job on your hunt I really like to see others with success. It reaffirms me that I still have unfinished business with Black Death!